Sham & Alvin. A Flight Medley Joint 3rd. Larry, Mau, Rachel, Alvin, Prima. Inter-State Team Joint 3rd. Eddie Chow (CEO IDM) & Larry Wong. Nick Chu. Trios Random. Runner-up. Eddie, Jilian, Michelle & Alan. Hello Bar Halloween Dart Tournament. 29th October, 2015. A fun and exciting event it was! 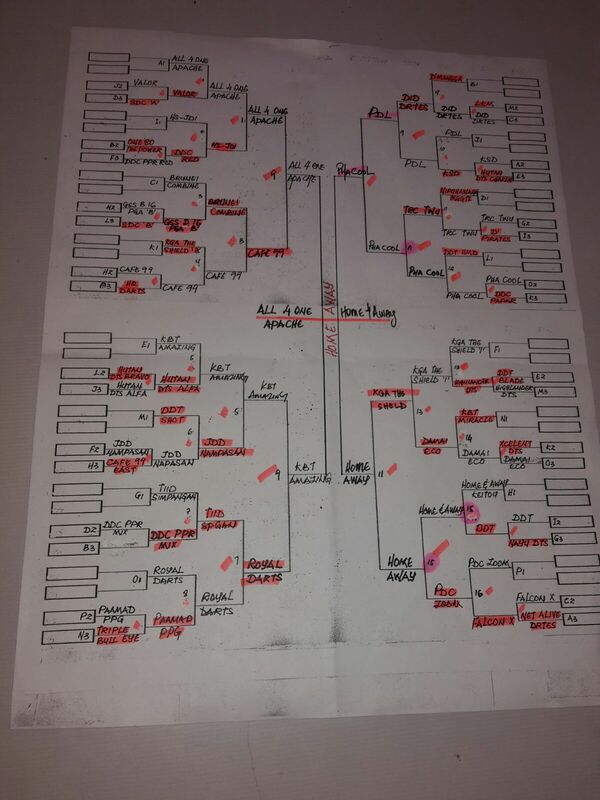 The tournament comprised A, B and C flights. Sixteen participants competed in each flight category. It was mandatory for the participants to wear costume or Halloween makeup. The entrance fee included a free makeup by Ash.B Beauty Room, Lintas Square. A Flight Champion: Larry Runner-up: Prima Joint 3rd: Adeline and Alvin Siah. Cash and medal. B Flight Champion: Kim Fung. Runner-up: Bobby. Joint 3rd: Alvin and Tony. Cash and medal. C Flight Champion: Wilson. Runner-up: Jack. Joint 3rd: Zhuang and Faye. Cash and medal. 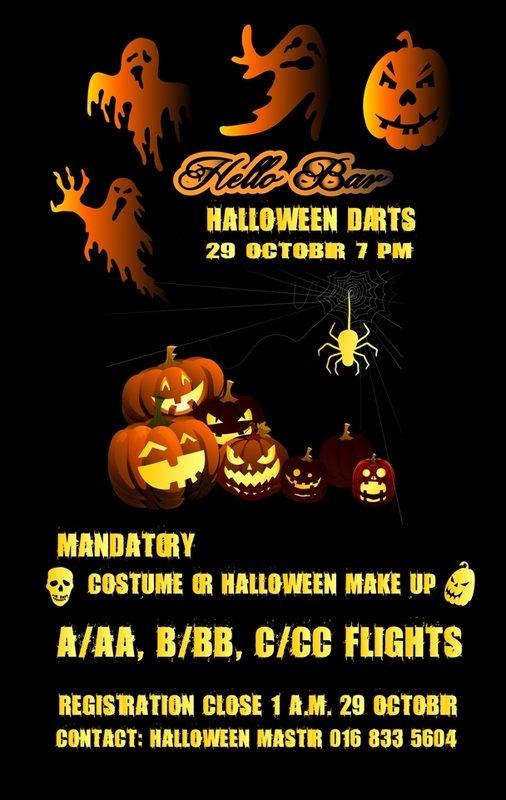 Halloween Darts Tournament, Hellobar, Lintas Plaza. 29th October 2015. 7 p.m.
*Mandatory Halloween make-up or costume. 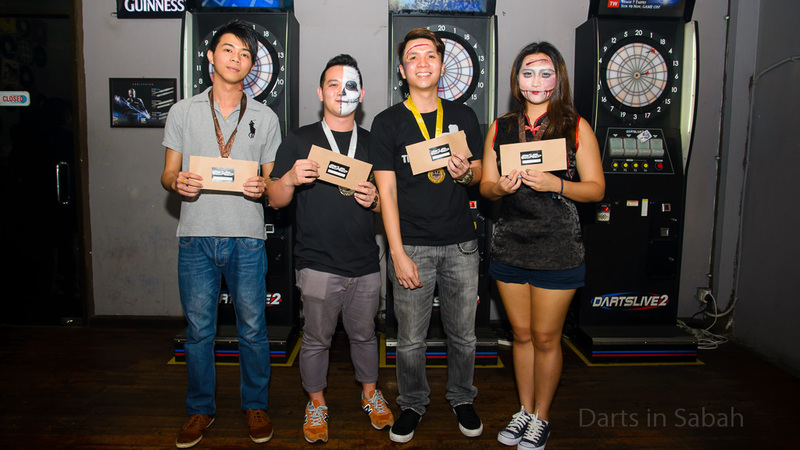 Darts On Inc Soft Launch & Double Championship 2015. 1st November, 2015. Coming up this Sunday, 1st November, 2015. 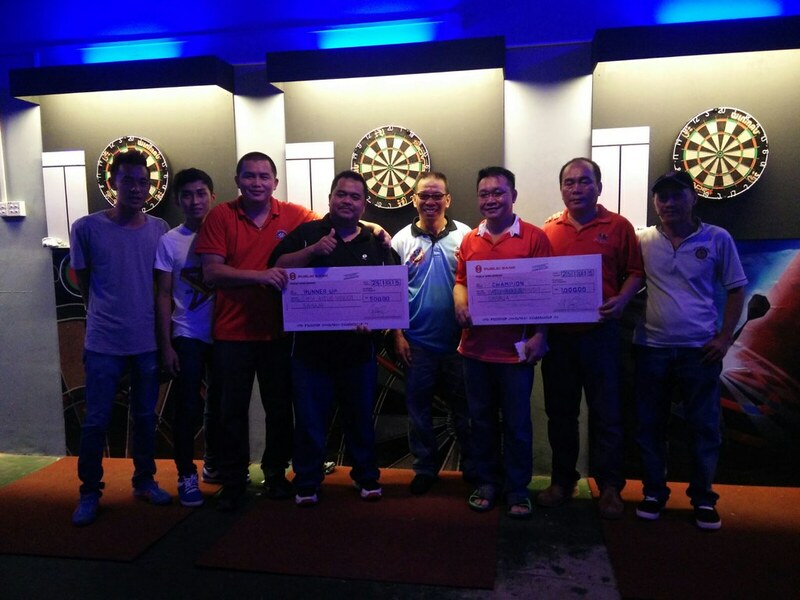 Darts On Inc Soft Launch & Double Championship 2015. 1st November, 2015 (Sunday) Roundrobin 4pm/6pm sharp. 6th November, 2015 (Friday) Knockout Stage 8pm sharp. Registration closes on 31st October, 2015. (Saturday) 8pm. Please refer to poster for details and contacts. 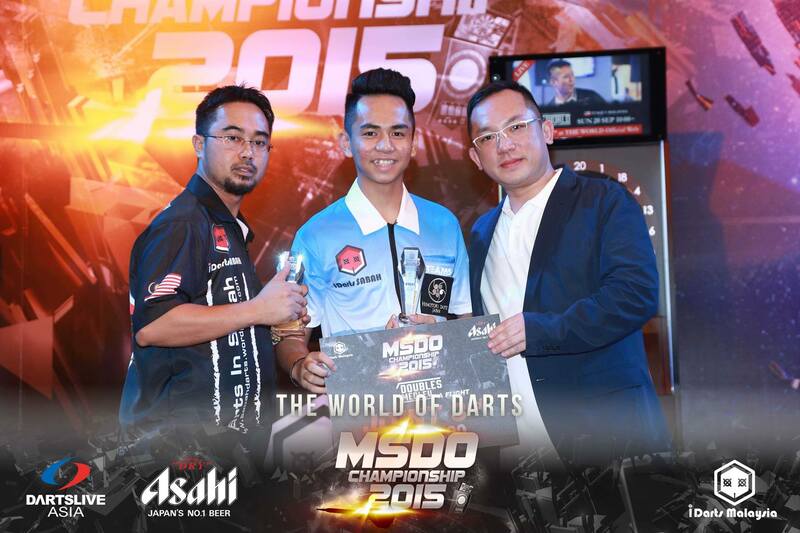 Darts On Inc Soft Launch & Double Championship 2015. Coming up this weekend! 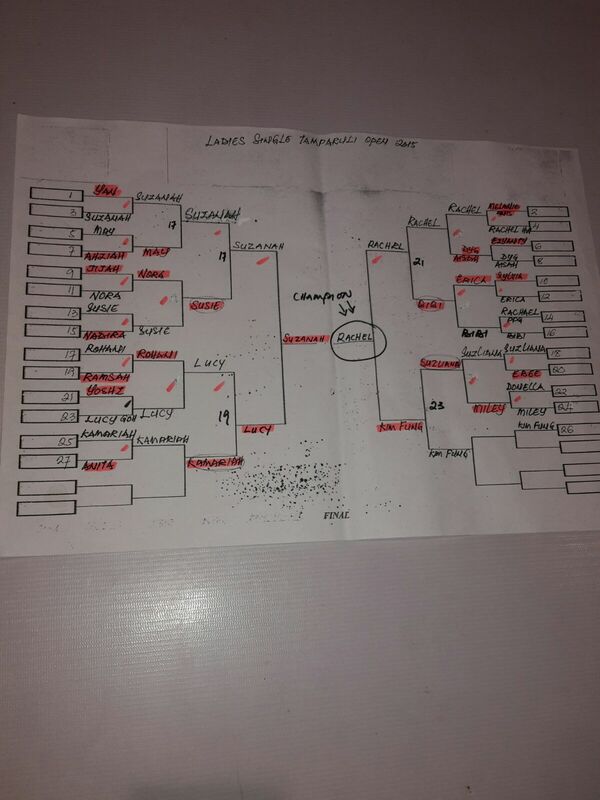 CLP Cafe Double Dart Tournament. 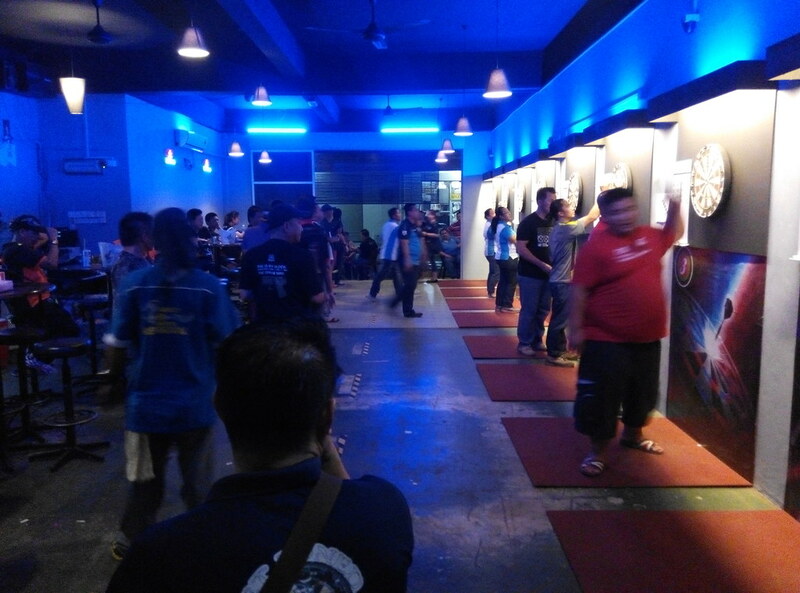 Update: W’Cafe Dart & Karaoke 1st Double Dart Battle 2015. Once again, Jerry & Frankie proved they are the top doubles pair. W’Cafe Dart & Karaoke 1st Double Dart Battle 2015. 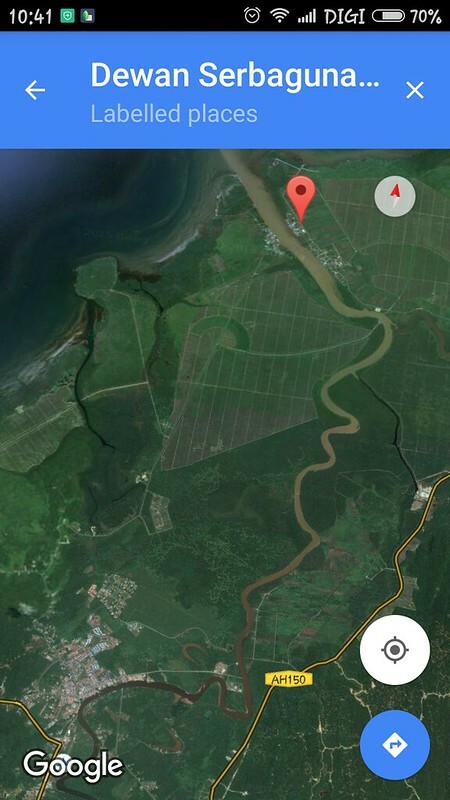 24th – 25th October, 2015. Country Heights. 27 teams competed in the event. W’Cafe Dart & Karaoke 1st Double Dart 2015. Champion Jerry & Frankie. 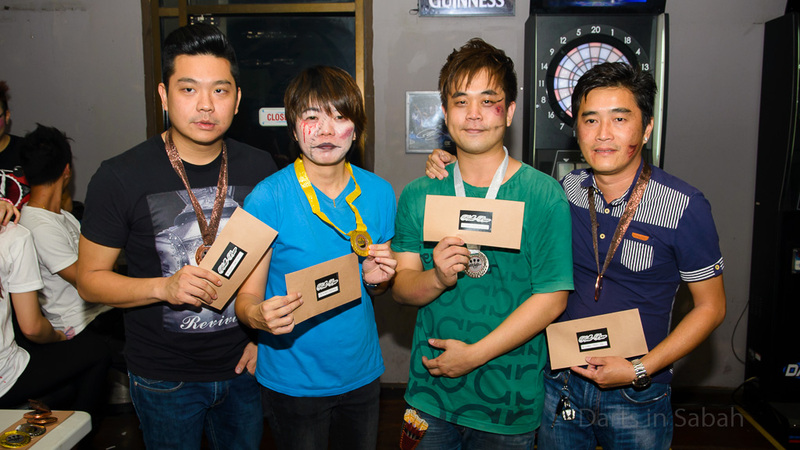 Runner-up King & J.
W’Cafe Dart & Karaoke 1st Double Dart Battle 2015. 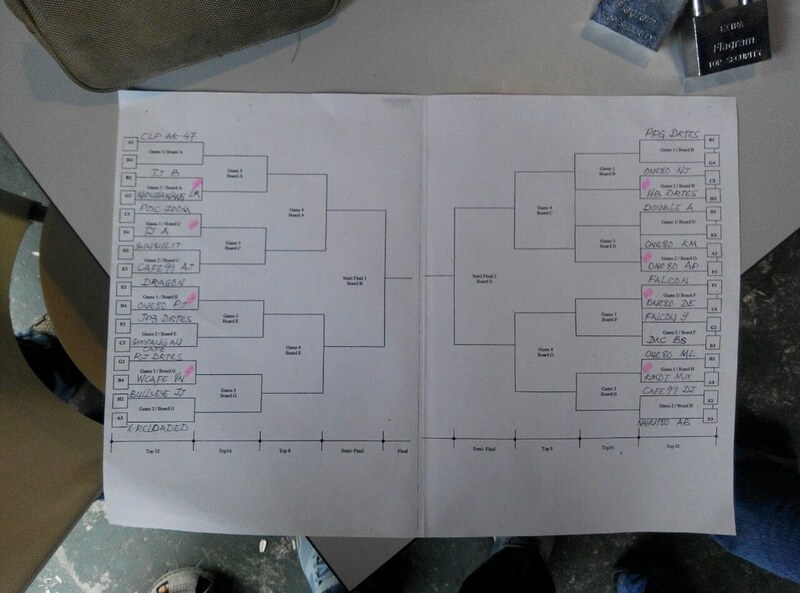 2nd day knockout bracket. W’Cafe Dart & Karaoke 1st Double Dart Battle 2015. Games in progress. 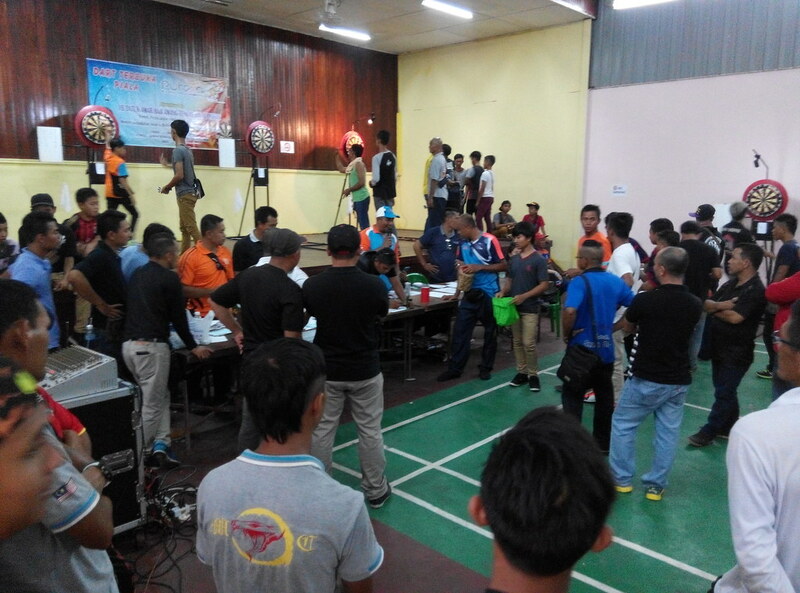 Update: Malaysia Soft Darts Open (MSDO) 2015. What an awesome weekend it was. 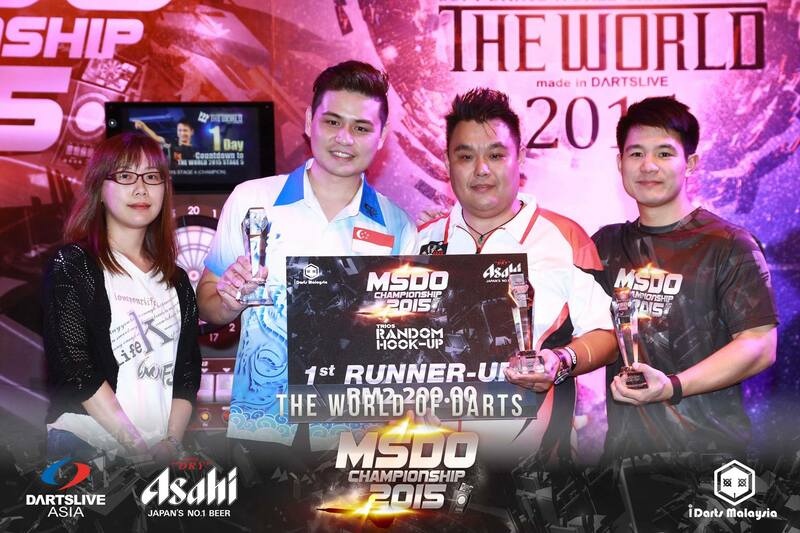 The MSDO 2015 turned out to be the grandest of darts tournaments in Malaysia. 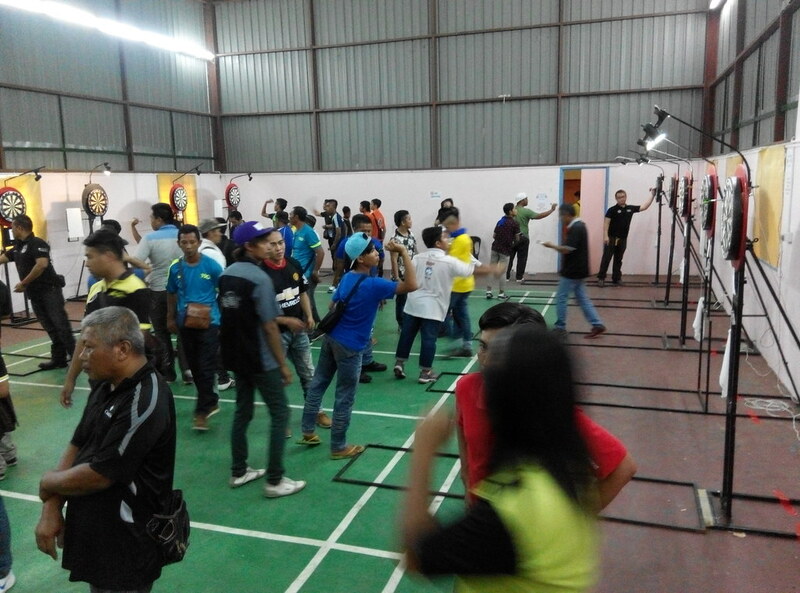 The Sabah contingent saw a whopping 49 darters competing in the tournament. 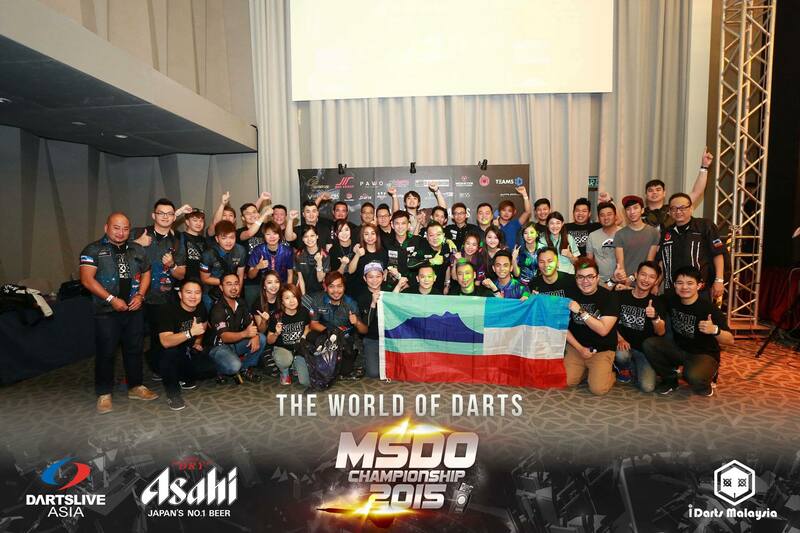 More than 800 attended the events, including darters from Hong Kong, South Korea, Japan, Taiwan, Macau, Thailand, Singapore, Indonesia, Philippines, Australia, UK, USA, France and Croatia! MSDO 2015 was conducted from 18th to 19th September with the concurrent The World Stage 5 on 20th September. The events were held at Vivatel KL. 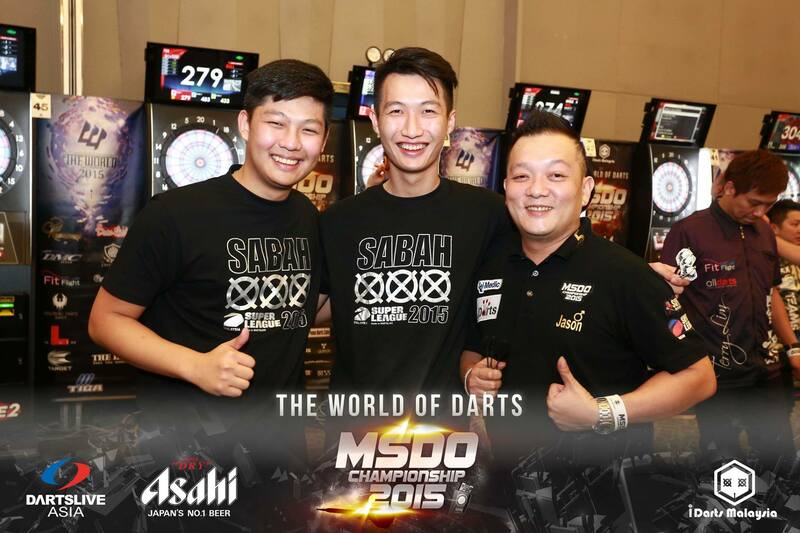 Part of the Sabah contingent of 49 darters. New record by Sabah! Sham & Alvin. A Flight Doubles Medley Joint 3rd. Nick Chu. Random Trios. Runner-up. Larry, Alvin, Rachel, Prima & Mau. Inter-State Team Joint 3rd. MSDO official photo gallery here. Lots of photos! 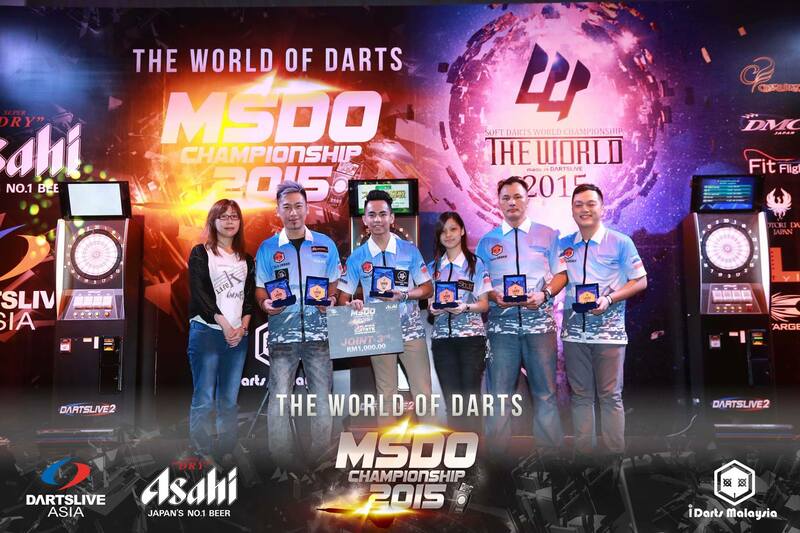 MSDO 2015 fanpage here. 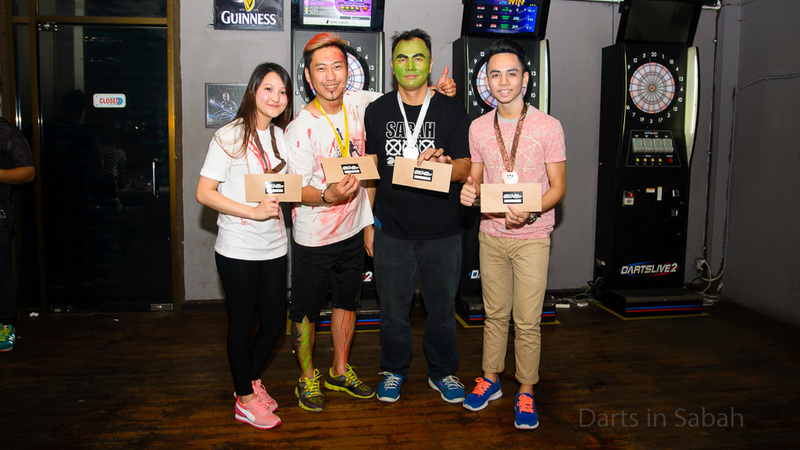 W’Cafe Dart & Karaoke 1st DOUBLE DART BATTLE 2015. 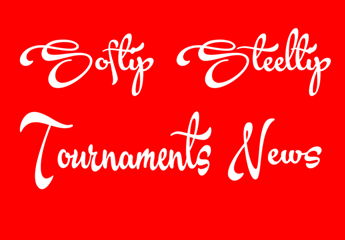 Steeltip tournament this weekend. 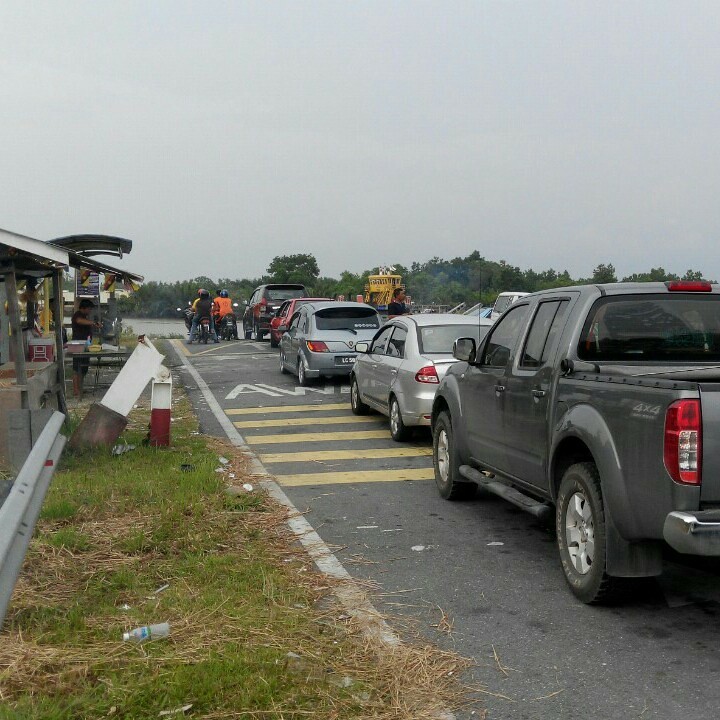 24th – 25th October, 2015. 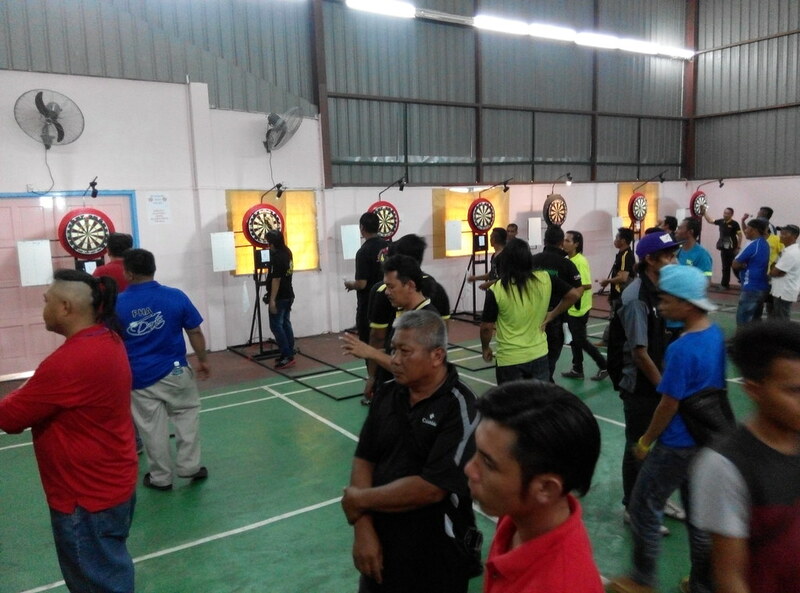 Update: Putera Kuala Lawas Open Double Darts Championship 2015. 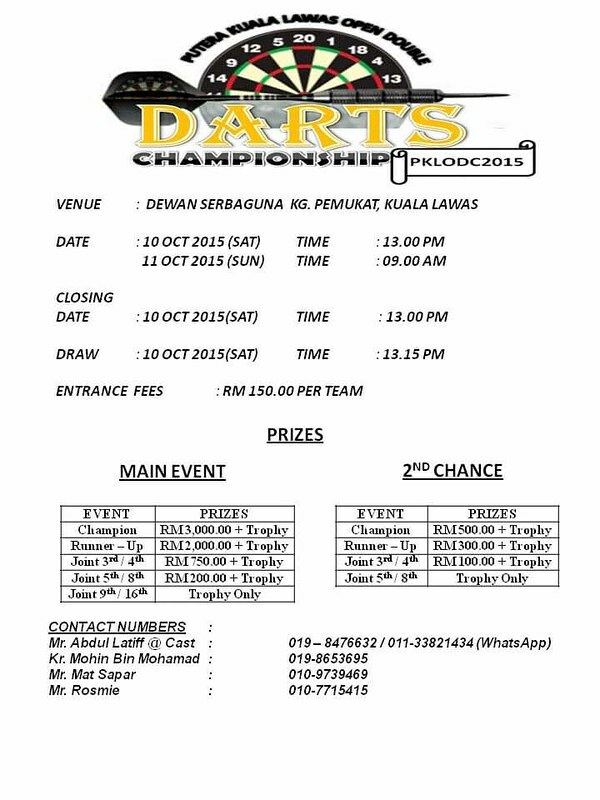 Putera Kuala Lawas Open Double Darts Championship 2015. 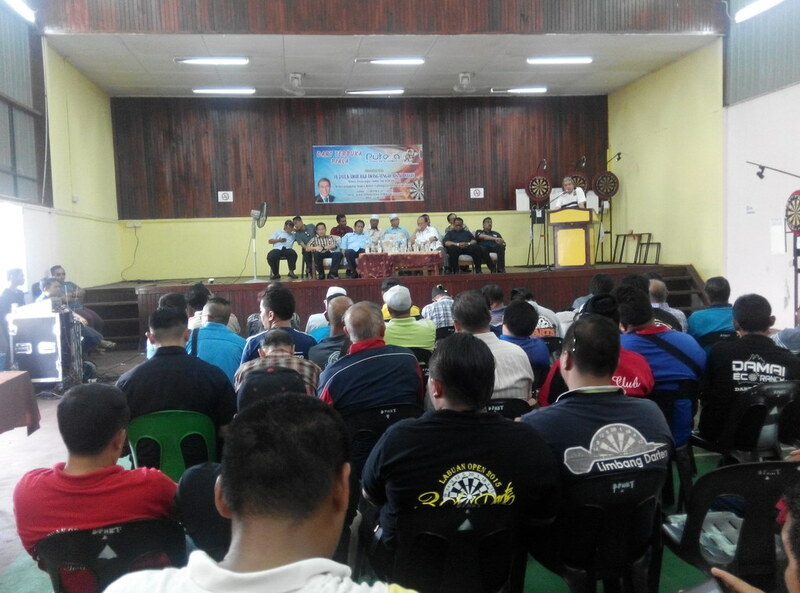 The event was conducted from 10th to 11th October, at the Dewan Serbaguna Kg Pemulat, Kuala Lawas, about 30 minutes’ drive from Lawas town via a ferry crossing of the Sungei Merapok. 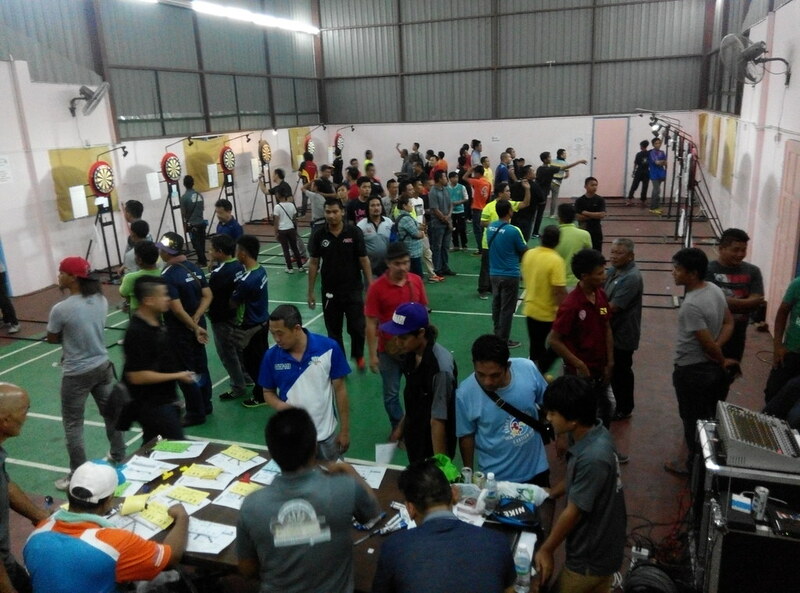 The event was well contested by a large crowd of 86 teams comprising about 50 local ones and the rest from Miri, Limbang, Brunei, Labuan and Sabah. Despite the hot weather and heavy downpour, the organising committee was well staffed and kept the event running smoothly. An official opening was held on the 2nd day (Sunday), by YB Datuk Amar Haji Awang Tengah Bin Ali Hassan (Menteri Perancangan Sumber dan Alam Sekitar II / Menteri Kemudahan Awam / Menteri Pembangunan Perindustrian Sarawak). Runner-up: Kg.Ayer Shield 2 (Brunei). Join 3rd: D’Mangga (Sabah) / Sulcon Johor (Miri). 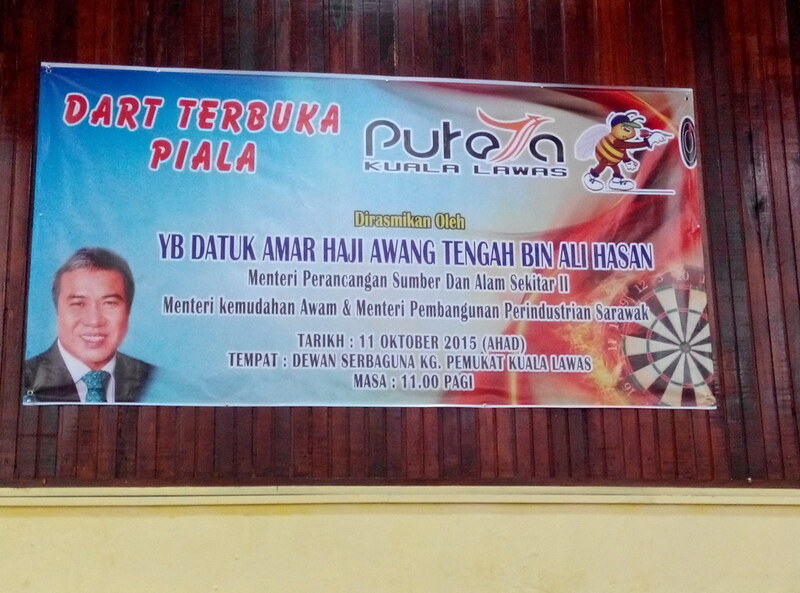 Putera Kuala Lawas Open Double Darts Championship. 10th – 11th October, 2015. Kg Pemulat, Kuala Lawas. Joint 3rd: Team D’Mangga (Sabah). 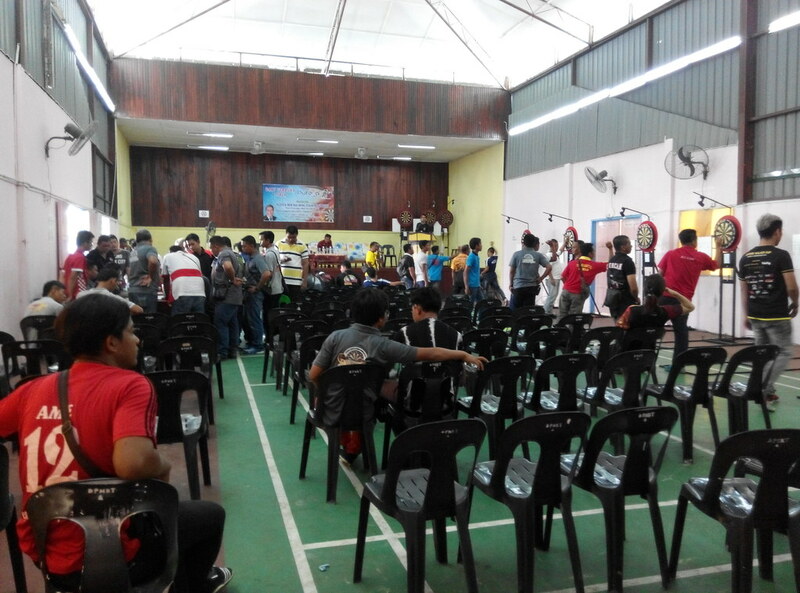 Location of event venue, Dewan Serbaguna Kg Pemulat, Kuala Lawas. 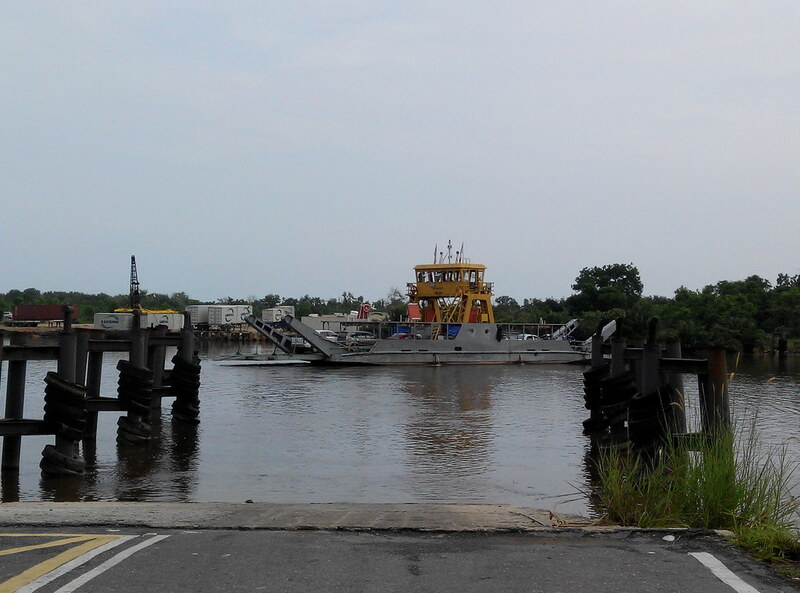 Crossing Sungei Merapok via ferry. Official opening by YB Datuk Amar Haji Awang Tengah Bin Ali Hassan. Darters warming up at the venue. 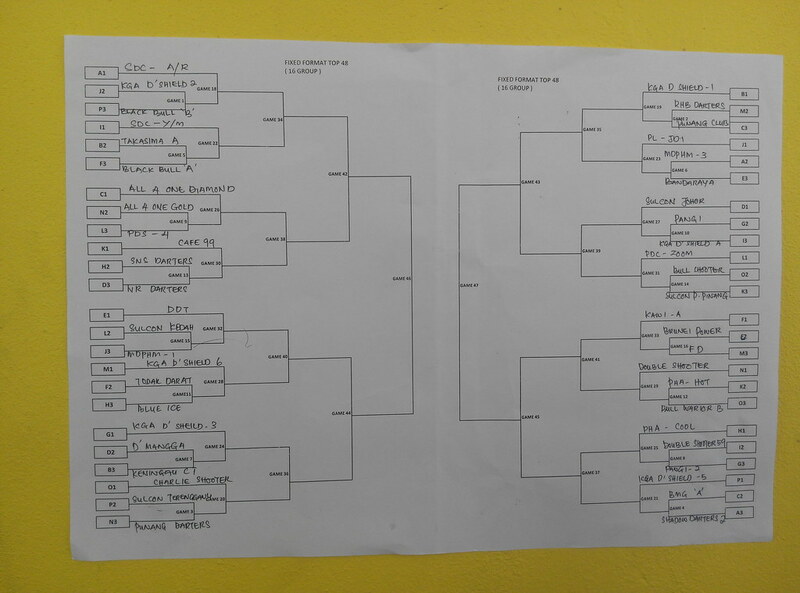 2nd day knockout bracket. 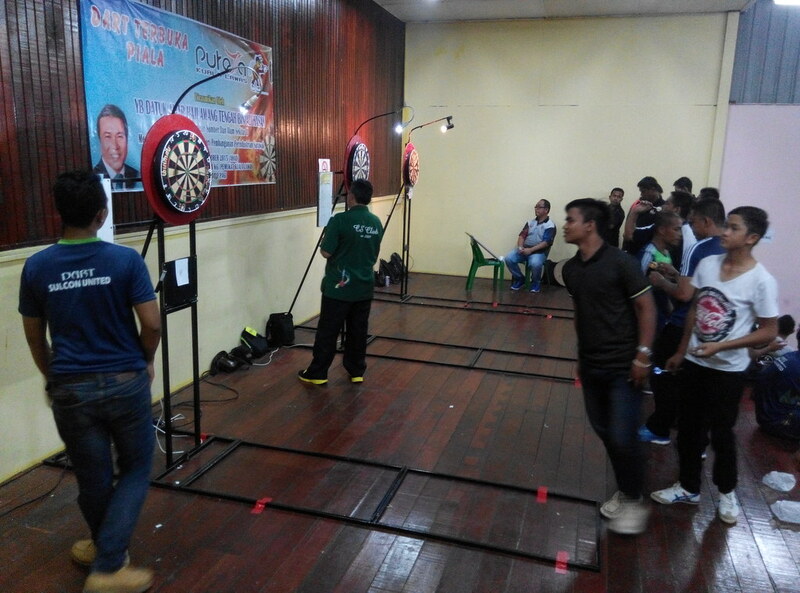 Putera Kuala Lawas Open Double Darts Championship 2015. 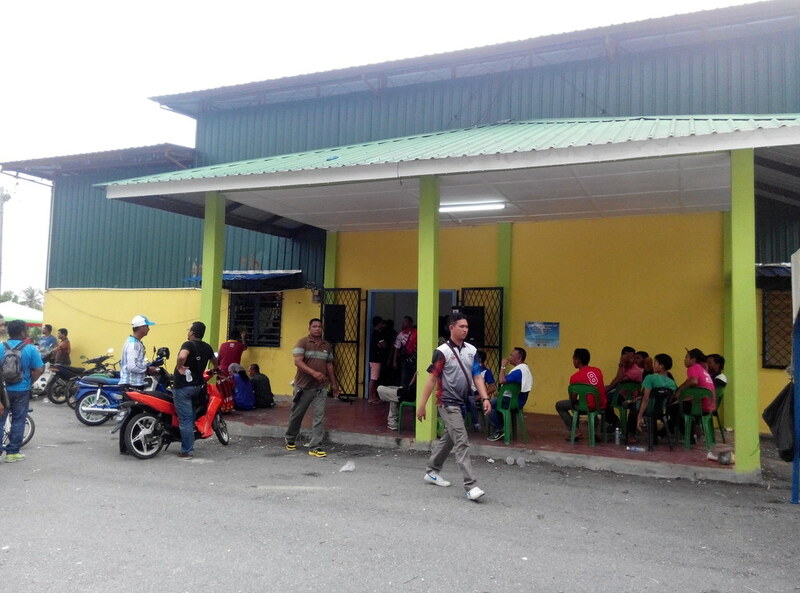 Dewan Serbaguna Kg Pemulat, Kuala Lawas. Coming up! LDP Double Dart Challenger Beaufort 2015 (Sabah Closed). 10th – 11th October, 2015. Closing date 25th September. Dewan Sri Panglima Hj Mohd Dun, Beaufort. Special invitation for Brunei and Labuan darters. For contacts and more information, please refer to details in the event poster. 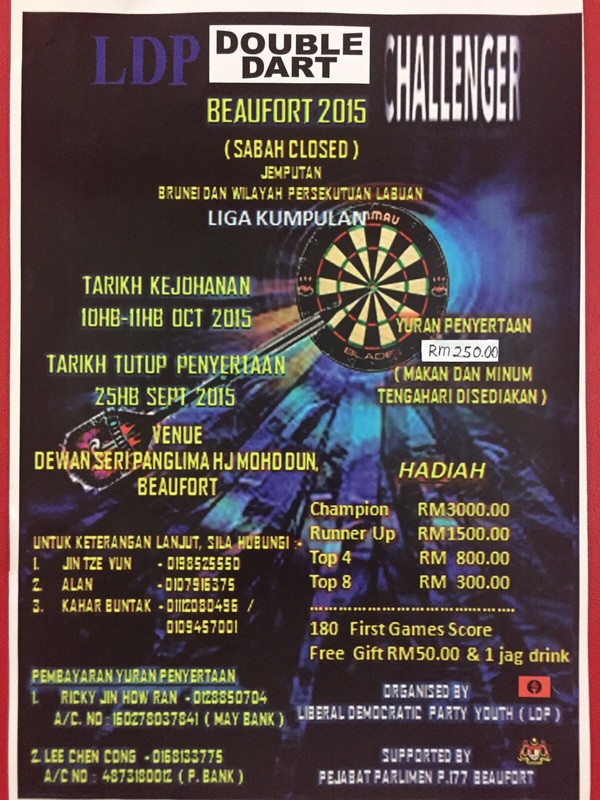 LDP Double Dart Challenger Beaufort 2015. 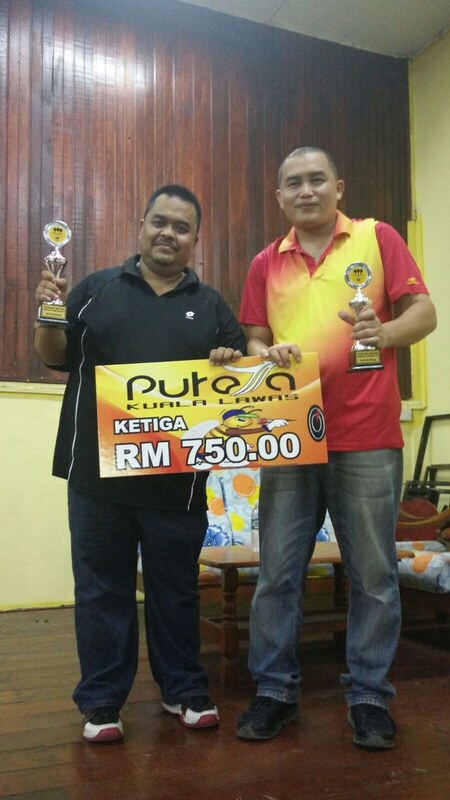 Results from Tamparuli Open Dart Battle 2015. Team Champion: Home & Away Keitou.